The batteries in your RV, whether they are providing power to run your lighting, music system or appliances or are used for starting your motorhome are the life blood of your recreational vehicle.If you take care of and follow proper battery maintenance procedures your batteries can provide many years of service. 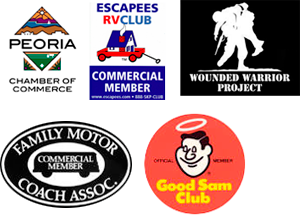 By following this common sense approach to RV battery maintenance you will increase your knowledge of batteries and have more fun using your RV. For the purpose of this article the discussion addresses Wet Cell batteries. It should also be noted this article is “Not Technical”, we will save that for a future in-depth article on batteries. What is a “Chassis” Battery? If you do not own a motorhome then you don’t have to worry about chassis aka “Start” batteries. The chassis or “Start” battery system may consist of one or more batteries whose sole purpose is to start the engine in your motorhome. Gas engines typically will have one battery and diesel engines will use two or more chassis batteries. These batteries are designed to provide instant high amperage output to turn over and start up the engine. What is a “House” Battery? All RV’s have at least one “House” battery. Depending on the size and type of your RV, “House” battery banks can use 4 or more batteries. RV house batteries are known as “Deep Cycle” type batteries. They are designed to supply a slow steady volume of D.C.(direct current} to power appliances, music players, lighting, pump water, power control panels that show you the volume of your storage tanks, and produce A.C. power (alternating current} using an Inverter. Simply for cost purposes, however, a deep cycle battery should not be regularly used for starting engines. Do I add acid to my batteries? ABSOLUTELY NOT, NEVER, NO WAY! DO NOT EVER ADD ANYTHING BUT WATER TO YOUR BATTERIES! What kind of water do I use? Because of the way batteries work, use only Distilled water, unless of course it’s an emergency. Many people today buy some type of drinking water so as long as it is not “Spring Water”, you can use reverse osmosis quality water if your battery water level is low. Under extreme circumstances you could use tap water but know this – anything other than distilled water will cut short the life of your batteries. 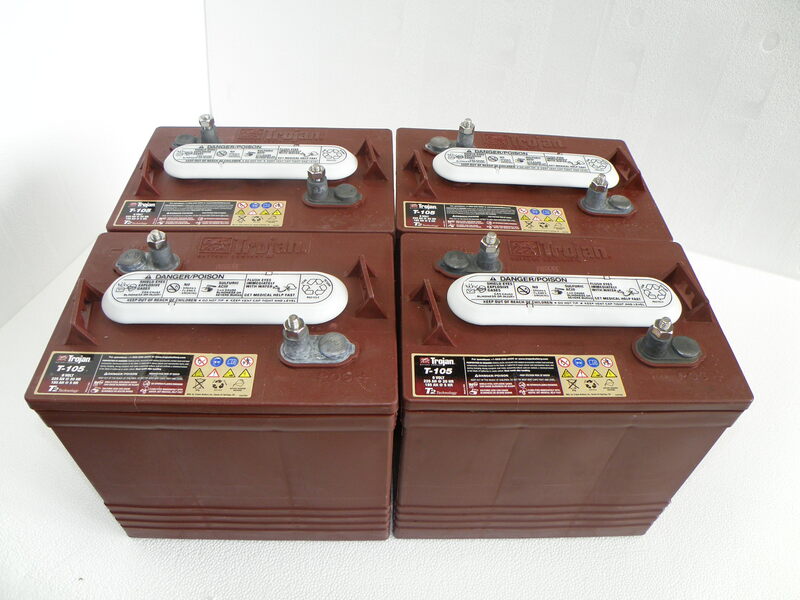 Adding the proper amount of water to your batteries is the most critical aspect of proper RV battery maintenance. The amount of water that each cell needs is determined by the location of the “Level Indicator” in each cell. Starting batteries have the indicator located very near the top of the battery. When looking in each cell you will see a tube and at the bottom of the tube is a ring or shoulder defining the length of the tube. The water level should be within no more than 3/8″ of the ring. ALL batteries require space between the top of the water in the cell and the top of the tube. Why? Because when the battery is charging the water level in each cell will rise.By allowing space for expansion the liquid will not exit the battery. Deep cycle batteries have a longer tube and require a little more patience when filling as it is more difficult to see where the tube ends. If you have very good light and access then you shouldn’t have any problem filling each cell. If access or lighting is difficult we recommend installing a manual Battery Watering System to maintain the water level in each battery cell. A Battery Watering System uses a water level indicator and a float for each cell and is the best most convenient system for maintaining the water in your batteries. Even if you have good lighting and access, these systems will save you money! 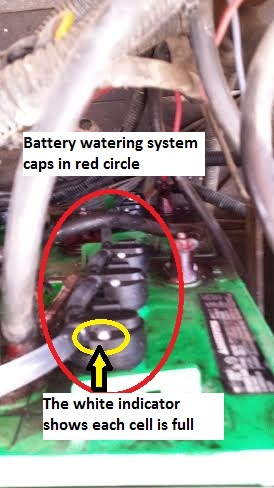 Call us if you need more information on Battery Watering Systems. How often should I charge the batteries? Fortunately today (exception being roughly pre-1990) all RV’s come with a multi-stage battery charger as part of the standard equipment. What this means is the on-board battery charger in your RV is designed to provide the correct amount of voltage and amperage to properly maintain your battery system. The more expensive motorhomes have equipment that provide visual displays with digital information that provide all the pertinent infornmation that describes the health of the battery system. Further discussion of this equipment goes beyond this article. For all intents and purposes you do not have to determine when to charge your batteries. How dirty are your batteries? If you have any debris whether it is dust, mud, road grime, or liquid deposits on top of your batteries one thing is guaranteed, your batteries will be dead soon! Yes, it is possible to short out your battery by allowing debris to accumulate on top of the battery surface. When cleaning the tops of your batteries never remove the caps to the cells and use only distilled water. When finished thorougly dry the area. It is also a good idea to use a Battery Sealer to seal the terminals. The batteries in your motorhome, 5th wheel, travel trailer, horse trailer, truck camper or pop up camper can be very expensiver to replace so take good care of them. Keep them clean, properly watered, and properly charged for the best results and to get the most use out of your RV. Remember you can always call Jeff if you have any questions. Happy Rv’ing and safe travels to all.